Duratrack completed this custom steel fabrication project for a customer in the telecommunication industry. 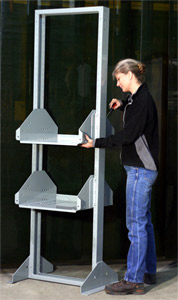 This rack measures 20″ x 24″ x 84″ and is designed to hold back up batteries. It is constructed of 10 gage carbon steel with grade 8 fasteners and powder coated ANSI 61 gray for maximum durability. This project required a number of fabricating and machining processes. In-house capabilities applied during fabrication include: laser cutting, stamping, forming, tapping, and welding. Because we have such a comprehensive offering of fabrication capabilities, we are able to provide customers with turnkey products that are formed, machined, and assembled in-house, according to their specifications. This saves customers time and money by offering them a single source solution that fits a range of applications. Dimensions, threads, and powder coating thickness were verified with calipers and gauges according to our quality inspection plan. We produce 800 of these battery racks per year, with a lead time of 2-4 weeks per order. For more information about this custom steel fabrication project, see the table below, or contact us directly. 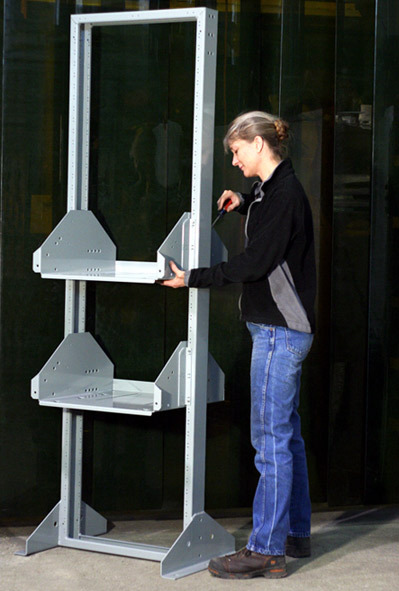 This battery rack is used for backup communication systems within a telecommunication application.